1.1 What is an egg white? 1.2 What is the function of an egg white within an egg? 1.3 What are the components of an egg white? 1.4 Why does an egg white becomes hard when cooked? 1.5 Who should eat egg white? 1.6 What are whipped egg whites? It is the colorless part of an egg, with a viscous texture in their raw state. In the same way as it happens to the egg yolk, when subjected to a high temperature, it becomes harder. Furthermore, if subjected to friction by means of beating it, it can increase its volume to four times, constituting what is known as “whipped egg whites“. The egg white constitutes approximately 60% of the volume of an egg. What is the function of an egg white within an egg? To protect the egg yolk from infections and external contamination of bacteria and other pathogens that may deteriorate it. To provide additional nutrients to the embryo to which the egg yolk makes a greater contribution. What are the components of an egg white? An egg white essentially contains water and protein, mostly albumin plus other proteins in lesser amount. Why does an egg white becomes hard when cooked? Because heat causes egg white proteins change their structure making it harder. Properties of cooked white egg are also different to those of raw one, since proteins become more digestive and also because some antinutrients are eliminated. 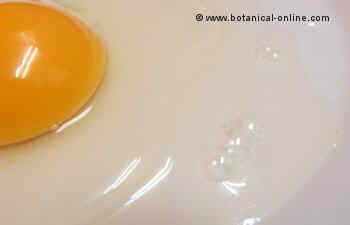 Antinutrients in the egg white prevent the vitamin B8 or biotin from being properly absorbed. Who should eat egg white? Egg whites are food especially important for those who want to eat protein without eating extra fat as people who wish to boost their the muscles, obese people, people who perform weight loss diets, etc..
Having no cholesterol, egg white is used as food for people who have their levels of cholesterol high, but they want to eat egg proteins. However, it should be noted that the food value of egg white is much lower than that of the whole egg or egg yolk, so, if you do not want to eat the whole eggs or egg yolks, you will be involved to take into consideration other foods that could provide the necessary nutrients that discarded egg does not provide. What are whipped egg whites? 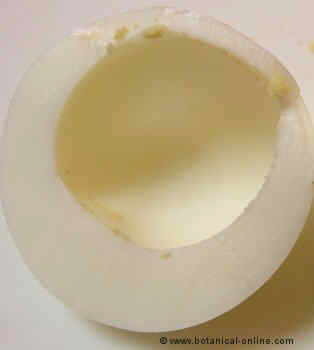 Photo of egg white. 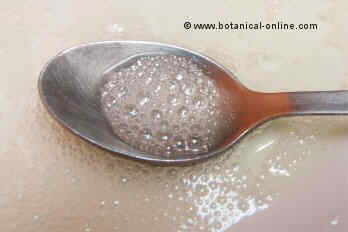 Note the bubbles formed by the air introduced into the egg white during whipping.